Back To School: Getting Your Child’s Sleep Schedule Back On Track! The summer holidays are bliss. The kids stay up that little bit later to make the most of the lighter evenings and, even better, they sleep in later too, which is all good, except for when it’s time to get back into the school routine come September. 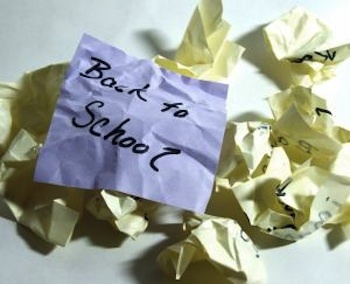 If you struggle to get your kids back into the school routine, rest assured you are not the only one. There are very few families who manage to stick to a sleep routine over the summer and rightly so. The summer holidays should be about having fun, staying up late and having lazy days if that’s what you are into. It’s just getting back into routine that causes the problem and many children can end up being sleep deprived for up to a month after the return to school. These simple tips should help you get back on track and make the holiday-to-school transition far easier for everyone involved. The best way to get the kids back into the sleep routine is to start a couple of weeks before they go back to school. The trick is to ensure that they are tired enough at the end of the day to go to sleep, so you want to start by waking them up earlier. Start by getting them up just 15 minutes earlier for a couple of days. Over the course of the next two weeks you can gradually set the alarm clock a bit earlier each day. They should be more or less in the school routine by the first day of term. The six weeks of summer holidays fly by so fast that you want to make the most of them. If you are getting up earlier over the last couple of weeks, maximise that time by making the most of the mornings instead of the evenings. If you can get out of the house and do something really active in the mornings you should find that the kids are much more tired by the time the evening comes around. This should make earlier bedtimes a little easier. This is the bit that most parents find tricky, especially when it is still light in the evenings and the kids really don’t want to go to bed! Just as with the morning routine, early bedtimes need to be a gradual process. Start with an incentive, such as reading an extra bedtime story, in return for going to bed a bit earlier and minimise distractions such as the TV and computer. Try to make your kids’ bedrooms as inviting and relaxing as possible. White bedroom furniture can help create a chilled out space that will also encourage them to drop off to sleep earlier. If you have kept them busy enough during the day, you should find that they are ready to go to bed that bit earlier every night until they are back on track for the first day of school. Kids need their sleep in order to perform at their best. Children aged under eleven need around ten or eleven hours of sleep a night and teenagers still need at least nine hours. Lack of sleep can make children distracted and fidgety in class and this can severely affect their ability to concentrate in school. Insisting on earlier bedtimes is crucial to ensure that they are ready to face the new school term. It should also keep them as rested and energised as possible. This guest post has been written and contributed by Zoe, who is currently collaborating with Archers Sleep Centre. 14 Responses to Back To School: Getting Your Child’s Sleep Schedule Back On Track! I started this week getting my kids back on a sleep schedule for school. It was easy, since I had to start getting them both up early anyways. My daughter has day camp this week, and I get her there really early. I started early and it was well worth it! I thought I would have had a little trouble getting my children back on schedule but we seem to be doing good. I’ve been trying to do this…I need my son, who currently wakes up at 9 am daily, to get up at 6 am! Kids need to get ready for back to school with getting the proper sleep weeks before they go back. I would just have the kids stick to their regular school routine even in the summer. Maybe have a few days in the summer where the kids can stay up late! HA! I wish my child had some routine in the first place! I do know how hard it is to get back into that school mode! Great tips. We try to keep their sleep schedules the same 80% of the summer so they don’t get out of whack. Great tips. We always start a few weeks before school starts back with getting their routines back on track. We have pushed our nap times to prepare for school. So far so good!! We started a week before school began and it worked out quite well for us! I think a sleep schedule is very important. My daughter is only 14 months, and ofcourse not in school yet, but it is still necessary! This so hard to do for the kids and for us. We try to keep a schedule all year long even during weekends so it is not too hard.